Rebuilt on the site of the old extensions is a new freestanding pavilion attached back to the main house by a two storey glazed link. This provides three levels of additional space amounting to over 2,500 sq ft. A basement houses a gym, home theatre and office. A ground floor provides the kitchen, dining area and a TV snug. An upper level, consisting of the master bedroom with en-suite and dressing areas, is accessed from the main body of the house via a bridge cutting through the glazed link. A smaller extension sits on the other side of the main house with a double garage, an extension to the main drawing room and a terrace at the upper level. As it presents itself to the street the pavilion has a restrained brick and tile material palette. 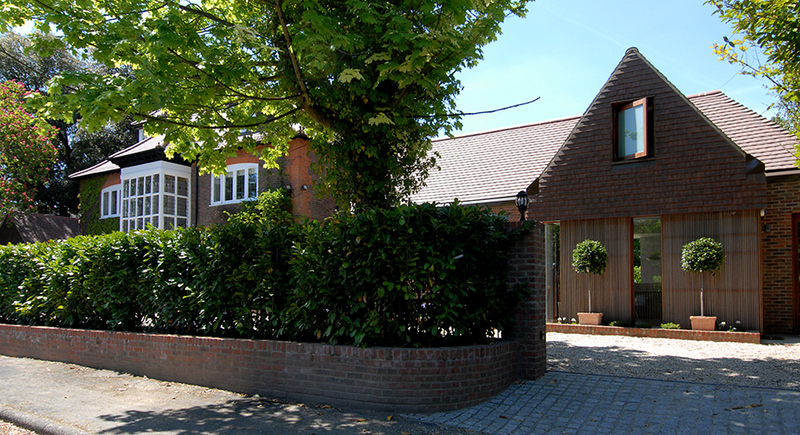 Facing the garden, the rear is predominately glazed with oak rainscreens that clad the masonry. A large sliding glazed screen, almost 8m wide by 3m high, opens up the entire length of the kitchen onto a yorkstone terrace. The oak flooring to the interior continues throughout the ground floor of the existing house tying new and existing together. 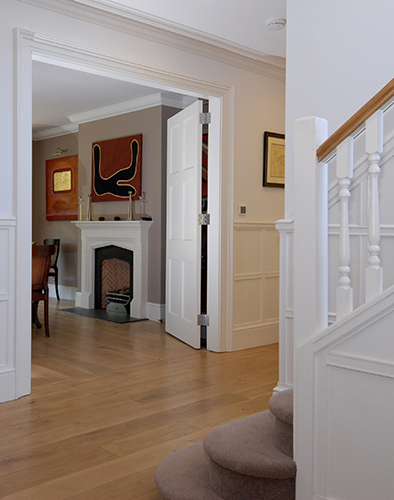 A new entrance hall was created in the existing house with formal reception rooms arranged off it. Completion December 2009. Contract Period 80 weeks.